How the residents of a small Scottish Island took ownership and turned it into a self-sufficient energy utopia and a model for sustainable energy microgrids around the world. 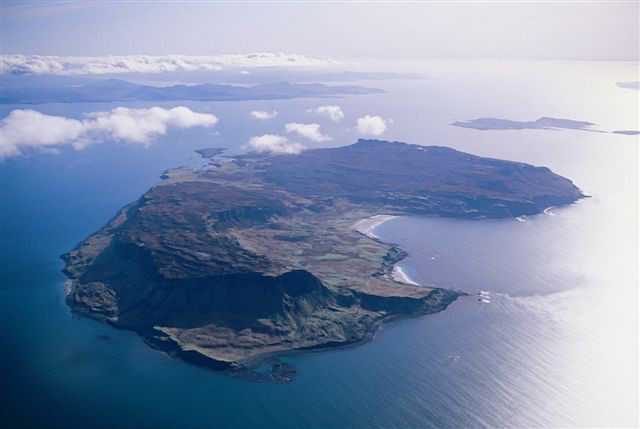 Nestled below Skye and Rhum, 12 miles from the Scottish mainland Eigg is one of the Small Isles in the Inner Hebrides. Despite having an area of just 12 square miles, it’s dramatic mountain ridge, An Sgurr makes it a dramatic feature of the Inner Hebrides. But Eigg’s most intriguing feature is the energy grid established 10 years ago which made Eigg the first of it’s kind – an island powered almost entirely by renewable energy sources. Following 800 years of Clan ownership, the Island had been taken over by a succession of Lairds from 1821. In the early 1990’s, after a German Artist bought the Island, the residents formed a community trust with a view to taking ownership. And in 1997, the residents used the proceeds of an earnest public fundraising campaign and a £17,000 Highlands and Islands Enterprise grant to purchase the Island from the Laird for £1.5m. With the new ownership, the islanders implemented a 10-year plan to make life on Eigg fruitful and sustainable. The most ambitious part of the project was to establish a sustainable energy infrastructure to provide energy 24 hours a day and replace the diesel generators that they relied on. The residents formed a community-owned energy company, Eigg Electric, and in February 2008, Eigg became the world’s first community to launch an independent power grid. By today’s standards, the energy grid is tiny but for a technology in its infancy, it was an ambitious project for a remote island community with a population of 65. 1km of underground pipework and 11km of cable connects the energy management system to homes and businesses around the island. Power comes from 4 x 6kW wind turbines, 10kW of solar PV, and 100kW of hydro. The energy mix reflects Eigg’s exposed Hebridean location and is designed to provide a continuous year-round supply with minimal use of the 2 x 70kW diesel-powered backup generators. The installation of the microgrid was relatively simple. The innovation was the energy management system, using inverters and transformers to top-up the 96 batteries when supply is in excess and draw from them when supplies are low, providing AC electricity to the community. At full capacity, the batteries can power the island for a full 24 hours. Living on an island, residents are fully aware of their consumption patterns. When everything gets shipped in and out, the waste islanders create is fully visible which makes everybody mindful of what they use. When it comes to energy, residents agreed to a tariff and a cap of 5kW for households / 10kW for businesses. Every building has an energy meter and everybody stops to consider how their personal consumption affects the community. When there’s a surplus, the excess energy goes to heat the public buildings for free. Eigg has become a model sustainable communities, not just of energy self-sufficiency, but of public ownership. The success of the Eigg project underscores what is possible when a community takes responsibility and works together to manage their own resources. Renewable energy wasn’t entirely new to Eigg in 1997. One or two buildings used a 1kW wind turbine, solar hot water heaters, and a 250W hydro plant. But the efficiency comes from connecting everybody to the microgrid. Eigg’s microgrid was built using 10-year-old technologies and, as the costs of renewable energy drive efficiency exponentially upwards, this model of locally-managed power grids becomes scalable beyond small communities to towns and cities. Hawaii gets 90% of its energy from fossil fuel that has to be transported overseas to the middle of the Pacific ocean at a cost of $5-6bn. Fossil-based energy is expensive – domestic energy bills can be $600 a month so there’s a massive need to get away from this massive oil-dependency. Hawaii has set a target to move to 100% renewables. It’s easy to envisage a future where energy supply and demand is met locally through a series of real-world and metaphorical islands. It brings opportunities for remote communities all over the world to adopt their own community-led energy initiatives.